Most people do not think about violent conflicts, wars and military occupation when they talk about health and healthcare. But the fact of the matter is that these factors do have profound effects on the health of millions of people around the world. The health of the vast majority of people in a war-affected region would be directly affected by the strain on resources – including food supply, medicines, electricity (which is required for storing food, for room heating and so on), housing and other infrastructure. People fleeing from a war would find it difficult to access food and healthcare, as the excruciatingly painful experience of 11 million refugees displaced from their homes due to the War on Syria shows. People in countries or regions under military occupation would find their health adversely affected by the brutalities unleashed by the occupying powers, restrictions on travel and communications, and so on. Environmental degradation and disasters directly impact people’s health, with people living on the margins being at the receiving end at a disproportionate scale. Issues such as these were major topics of discussion at the fourth People’s Health Assembly in Savar, Bangladesh. The plenary session on “social and physical environments that destroy or promote health” saw presentations that called attention to the major factors that shape the health conditions of the Rohingya refugees in Bangladesh, the people of Palestine, and people affected by ecological degradation and genocides. Shatha Odeh, from the Health Work Committees of Palestine, showed how Israeli occupation remained the main determinant of the health of Palestinians. Before the 1948 war, Palestinians owned 87.5% of the total area of Palestine, while currently 85% of Palestinian land is under the control of Israel. Though the Oslo accords of the 1990s were supposed to be significant steps towards peace, they came with a hidden cost – they allowed Israel to continue the occupation without being held accountable. Israel used it to justify the expansion of the illegal settlements. Confiscation of land, expansion of illegal settlements, checkpoints, the apartheid wall, Israeli control over Palestinian natural resources, shootings, killings, indiscriminate arrests, the siege on Gaza and movement restrictions have been brutal violations of basic human rights, affecting the Palestinians’ right to health. The barrier in the West Bank and the permit regime limited access to the specialized hospitals in East Jerusalem, including several hospitals which are the main providers of routine, emergency, secondary and tertiary care for Palestinians from the West Bank and Gaza Strip, Odeh said. The humanitarian crisis in Gaza is such that 95% of the water is undrinkable, electricity is available only for four hours per day, and 46% of children suffer acute anaemia. Two million people are denied the freedom of movement. The unemployment rate is 45%. Nearly 50% children express no will to live, 72% of the families in Gaza have no food security, and 85% of Gaza families rely on humanitarian aid. Monthly shortage in the healthcare system is estimated to be 30%. There are restrictions that affect the functioning of hospitals, apart from attacks on hospitals, clinics and health teams, according to Odeh. 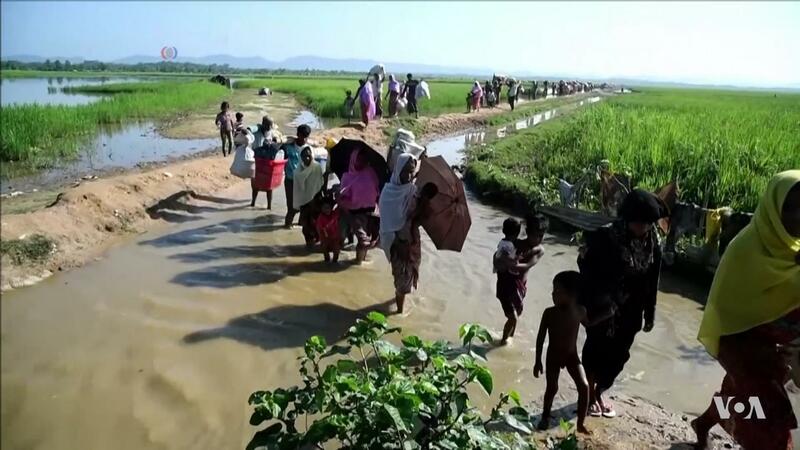 Shireen Huq of Nari Pokkho, a women’s activist organization in Bangladesh, spoke on the conditions faced by the Rohingya refugees in the country. There are 1 million Rohingya people living in refugee camps in Bangladesh. A major influx of Rohingyas occurred in 1978. Most of them were repatriated through negotiations with Myanmar, but yet another wave of refugees came in 1991. This time, the negotiations were not that successful – about 225,000 refugees were not accepted back. Many people think that Rohingya refugees are all Muslim, yet there was a large camp in Cox’s Bazar with Rohingya Hindus, Shireen Huq said. Recently, they celebrated Durga Puja as well. “Every Rohingya woman I talked to in September 2017 after a major exodus [beginning in August that year] spoke of having been subjected to multiple rapes,” Shireen Huq said, while giving an account of the brutal sexual violence faced by Rohingya women. The situation of the refugees was very bad and while NGOs were trying to provide health services, family planning services were often unavailable to Rohingya women, she said. Fran Baum, distinguished professor at Flinders University, Australia, who spoke at the session, noted that people living in poverty, indigenous peoples, refugees and children were among those whose health suffered the most as a result of unequal distribution of health. There are 68.5 million displaced people, including 24.5 refugees, with 2.9 million new asylum seekers in 2017 alone. Racist, xenophobic and fascist forces in the US, Europe, Australia and so on are exploiting the fear of differences to drum up sentiments against refugees and asylum seekers. At the same time, ecological disaster is staring us in the face. Baum quoted WHO Director General Margaret Chan, who said in 2016, “Climate change is the defining health issue of the 21st century… A ruined planet cannot sustain human lives in good health”. 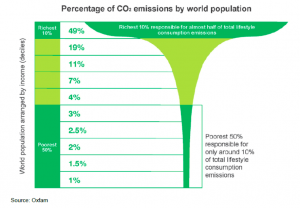 The richest 10% of the world are responsible for almost half the total lifestyle consumption emissions of carbon dioxide, while the poorest 50% are responsible for only around 10% of the such emissions, a study by Oxfam has shown. The unfair global economic and political system, with its growing inequities, is reflected in excess wealth and over-consumption for a few and under-consumption for the vast majority. A pictorial depiction of this phenomenon resembles a champagne glass (see figure below) – with most of the drink going to the rich and the poor having to satisfy themselves with a trifle at the bottom. The result of all these is an overlapping of crises on various fronts, such as economic, social, ecological and health. The poor tend to bear the brunt of such crises which are the products of the actions of the rich. “We need to govern for health and well-being, not for profit, redistribute wealth, tame corporations, provide healthy employment and housing for all, and protect and value the natural environment,” Baum said. One could add that a system whose inherent tendencies reproduce and accentuate inequalities is singularly incapable of saving the planet and its inhabitants from military and ecological catastrophes. Capitalism has historically shown itself to be incapable of surviving without wars, while the path of unplanned, corporate-driven “growth” it has spawned leaves no space for effective solutions to the ecological catastrophe that is already on its way. The struggle to ensure health for all, therefore, becomes a struggle for a new kind of society as well – a society that places people over profits. Hey Buddy!, I found this information for you: "What do violent conflicts have to do with health? Everything, says People’s Health Assembly". Here is the website link: https://peoplesdispatch.org/2018/11/20/what-do-violent-conflicts-have-to-do-with-health-everything-says-peoples-health-assembly/. Thank you.